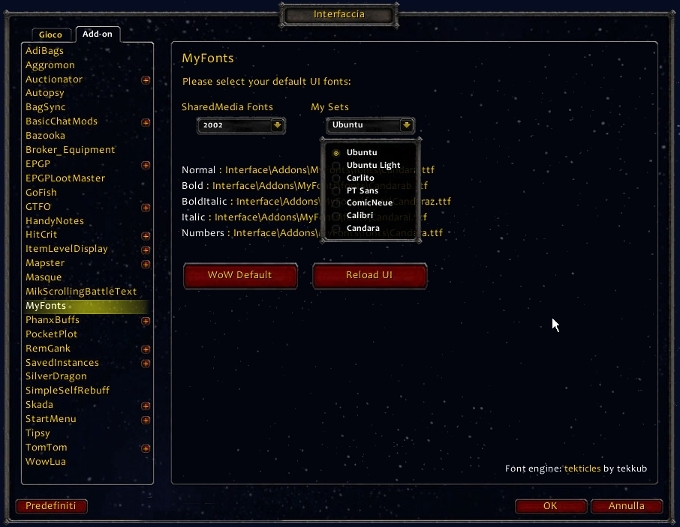 A small addon for changing default UI fonts and/or adding them in LibSharedMedia. "Ace Futurism is a simple techno font inspired by multiple that already exist. Was initially to be used in a game but the game halted being worked on so I finished up the font and here it is." PT Sans is a drop in replacement of Myriad font by Adobe. It is licensed under the OFL 1.1. Carlito is a drop in replacement for Calibri Fonts. Metrically compatible with the current MS default font Calibri. on behalf the wider Free Software community and the Ubuntu project. The technical font design work and implementation is being undertaken by Dalton Maag. Comic Neue is a casual script typeface released in 2014. It was designed by Craig Rozynski as a more modern, refined version of the ubiquitous, but frequently criticised typeface, Comic Sans. Calibri is a humanist sans-serif typeface family designed by Lucas de Groot. and replaced Arial as the default in PowerPoint, Excel, Outlook, and WordPad. It continues to be the default in Microsoft Office 2010 and 2013. Candara is a humanist sans-serif typeface designed by Gary Munch and commissioned by Microsoft. designed to work well with Microsoft's ClearType text rendering system. The others are Calibri, Cambria, Consolas, Corbel and Constantia. of Standard Alphabets. For the second half of the 20th Century, it was the font most used on road signs in U.S., Canada, Mexico, Australia, Spain,Venezuela,the Netherlands, Brazil, Argentina, Taiwan, Malaysia, Indonesia, India, Mongolia and New Zealand. Rather than sticking too closely to government specs, Expressway is a more practical design that still holds on to that old, road sign feeling. The full family has 7 weights, 2 widths plus italics for a total of 28 styles. This font includes a license that allows free commercial use: sometimes referred to as a desktop license. Verdana is a humanist sans-serif typeface designed by Matthew Carter for Microsoft Corporation, with hand-hinting done by Thomas Rickner, then at Monotype. The name "Verdana" is based on verdant (something green), and Ana (the name of Howlett's eldest daughter). According to a study of online fonts by the Software Usability and Research Laboratory at Wichita State University, participants preferred Verdana to be the best overall font choice and it was also perceived as being among the most legible fonts. It is part of Microsoft's TrueType core fonts. Lauren is a font developed by Computer Support Corporation. It is now free for personal use. This prevent an off screen widget when there are too many fonts. - Simplified and removed unused code. 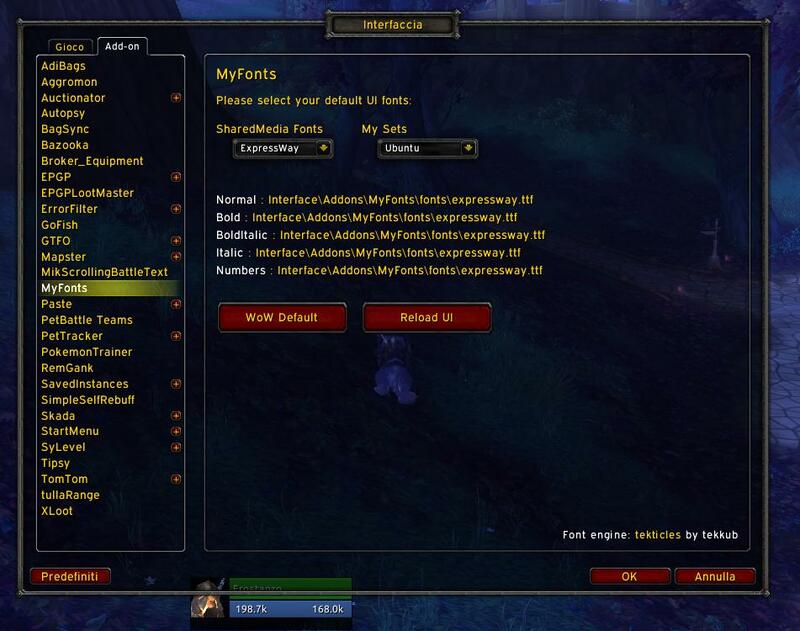 - now the addon can set the fonts for the whole UI. Nice addon, but it seems i have alot of fonts, i guess thru shared media, but being that i have alot when i click on the drop down menu for show my fonts it only shows fonts that fit on screen, no slider bar to scroll up and down to my other fonts. I think I have fix the problem with the latest version. Yes, I can imagine the problem. I'll have to check and fix this iussue, thanks. Uhm ... can you please report which fonts can you see and use ? Thanks very much for the report and sorry for the problem. upd. Still not showing it in dropdown menu ( Donno may be its cause of localization issue? Last edited by Ak1ra : 04-08-15 at 11:32 AM. I really don't know why it don't work for you, but anyway I have added expressway fonts to MyFonts. I'll try to upload the addon (which is ready and I am using right now) asap. 1) Do you see your fonts in the dropdown menu of MyFonts ? And can it be used to change all the interface ? So I can understand if it is correctly registred with sharedmedia. 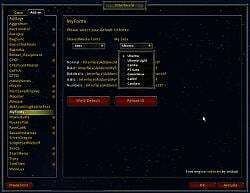 2) Which damagefont addon do you use ? Last edited by gmarco : 04-06-15 at 10:55 PM. 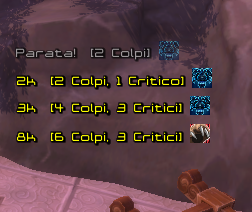 rly nice addon, can U please tell/show me how to add my own font to be able to use it in game with this addon? -- "Ace Futurism is a simple techno font inspired by multiple that already exist. -- on so I finished up the font and here it is." In this way you push your font in libsharedmedia and use it as game font later choosing by drop down menu in the interface options. 2) The long answer is different. And then change it in some places in the code. I suggest for this to look to code or to experiment before with the solution with a font with only 1 flavor like in the short solution as above. Last edited by Ak1ra : 04-06-15 at 04:41 PM. Last edited by gmarco : 04-06-15 at 02:00 PM.